Lenders help support a healthy and thriving housing market, especially during periods of fluctuation and uncertainty. Not only do lenders provide mortgage loans to first-time homebuyers, but they also administer loans for important urban development initiatives and new construction projects. The housing industry is undergoing significant changes. With higher interest rates, the refinance business has declined. The market pool has also decreased in size overall. Nationwide, lenders are seeing a distinct rise in competition. In this changing environment, mortgage companies are looking for ways to stand out in the marketplace. Lenders are confident that the future industry outlook will be positive if companies are willing to adapt while prioritizing their clients’ needs. They believe it is important to strike a balance between technology and in-person customer service interactions. 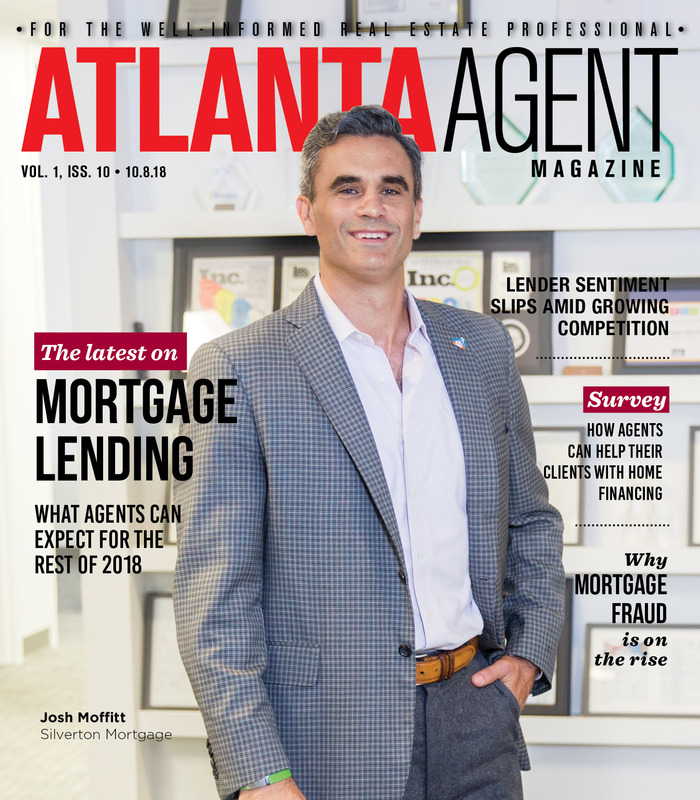 Atlanta Agent Magazine recently sat down with three lending professionals to hear their thoughts on the current housing market, challenges in the industry and how to improve the lending process for homebuyers in the future. What are your thoughts on the current status of the mortgage industry? Josh Moffitt, president and CEO, Silverton Mortgage Specialists: Currently, I think the mortgage industry is strong. It’s projected to be around a $1.6 trillion marketplace for 2019. That’s down a little from the previous year, so it is slightly going down, but it’s still really strong and a very robust industry. The marketplace is vast. And the underwriting, the criteria of lending, and the health of the business are still really good. Holly Walther, branch manager, Holly Walther & Team, Success Mortgage Partners: I believe that we are currently in an over saturated market. Every day more companies are moving into the mortgage business, increasing competition, lowering returns and diminishing customer service. Craig Shoemaker, Georgia/North Florida/Tennessee division manager, SunTrust Mortgage: The mortgage industry has always been competitive, and that’s especially true today in a rising interest rate environment when refinancing volume declines, and lenders are especially focused on buyers. Compounding that in Atlanta is the relatively low supply of houses on the market which creates a real sense of urgency for buyers, and their lenders to respond quickly and effectively so a deal gets done. Like the entire financial services industry, technology is creating significant shifts in how people seek and interact with mortgage providers. Some people still want an in-person process where others may want an all online or digital experience. Successful mortgage providers deliver the experience their clients want and offer reliable and knowledgeable mortgage experts that can help their clients understand the process, the mortgage options available to them, and provide guidance and assistance throughout the origination and servicing process. Mortgage interest rates remain relatively low, but there has been a recent rise and some experts say it could continue to increase. What are you projecting? Moffitt: I think the overall thought is that interest rates will continue to slightly rise as we move through 2018 and 2019. It should be paced — we shouldn’t really have big spikes, peaks or valleys. If anything, it should be a nice, steady rise, which supports a healthy economy. If you put it into a historical perspective, rates are still incredibly low. But even with where the rates are at and where they could rise to in 2019, they’re still not anywhere near where I think is prohibitive for folks buying. In some areas throughout the country, and Atlanta’s no different, we’ve had a decent amount of home depreciation throughout the years, so as homes rise and rates rise along with them, that does add pressure. But, as long as you have a wage increase to go along with it, then it should work out okay. Walther: As the economy continues to improve, interest rates will rise. I will be surprised if we don’t see rates north of 5.5% by the end of 2019. Shoemaker: Overall we’re in a rising interest rate environment, but we prefer not to speculate around day-to-day or week-to-week rate movements. While rates may impact some buyers’ decisions, we believe it’s a good time for people to buy a home if it’s among their goals and they’re prepared for the financial and overall commitment that homeownership requires. Moffitt: I think everybody is seeing tighter margins. One reason is the increased competition. With technology, it’s easier for customers to look around and get quotes. It keeps everybody’s pencil really sharp when customers do that, which is great. You also see the refinance market dwindling down, which everybody knew was going to happen with rates going up. Now, lenders that were traditionally doing refinances want to get into the purchasing business, which can be hard because it’s less of a commodity than a refinance. One way to do that is to compress rates and be the low-cost provider. Then you have the overall market pool shrinking, which again creates tighter competition and more aggressive rate quoting. All of that has led to this year-long tightening of the margins throughout the industry. But for those that can execute well throughout, they’ll be more than okay. Obtaining cheaper cost of funds is also a big deal in the future of the industry because that plays into your margins and what you borrow against. The more you can reduce that, the better. Walther: We live in a world where perception is reality and we all want it now. Take five minutes to watch TV and you will see where companies are convincing consumers that a mortgage is as simple as one, two, three in five minutes on an app on their phone. While that may provide an instant decision, nine times out of 10, it’s not the real deal. Consumers perceive this to be a benefit initially, but in the weeks to come they find themselves in situations where they no longer qualify, money is invested and or lost, or they are settling for a loan structure that is far different from what their initial decisions were made. This is a huge disservice to the consumer and our industry. Shoemaker: We’re facing three main challenges in our business today. Technology is changing every aspect of our business from how clients interact with us and how we process applications to closing and servicing the loan. Successful mortgage lenders are investing in technology and in people to enhance the client experience and differentiate themselves in a very competitive industry. Secondly, with housing supply low in many markets, many buyers have an acute sense of urgency once they find the home they want to buy. They are especially eager for quick responses and seamless process to ensure an on-time closing. We understand that, and our team works diligently to ease the stress of the homebuying process and works with clients and their agent partners to close the loan as quickly as possible. Lastly, the interest rate environment has dramatically slowed the refinance business compared to recent years which means lenders are even more focused on buyers. That increased competition is good for homebuyers as lenders seek to differentiate themselves in the market. Moffitt: Strategically, we’re in an interesting time where technology is making its way into financial services by all accounts, not just mortgages, but also for bankers and stockbrokers. You have to find the right balance that meets the customer’s expectations, demands and desires. Communicating with the consumer the way that they want to communicate is a big focus of ours. Buying a house is a big financial decision; but also emotional on top of that because it’s a big deal for folks. It’s about finding that right balance between where technology helps but doesn’t necessarily replace the human touch and human communication. Walther: We aim to provide a homebuying experience that you’ll remember as smooth, stress free and positive. We do this through education, top notch communication and customer service. Client needs are our top priority. We want you to have the kind of positive experience that will inspire you to tell others about us. We listen to our clients’ needs and customize a mortgage solution to accomplish all their goals. It is our job to be their advocate and provide them “what” they need based on their long-term goals. Those goals will range from: affordable payments, cash reserves to help improve their home or protect their family, tax benefits to maximize or offset their returns, term of the loan for retirement or achieving financial freedom, and investment to maximize their return. Shoemaker: We focus on helping our clients achieve financial confidence. We believe our purpose-driven culture, client-first approach, and commitment to providing access to a full array of mortgage options and knowledgeable experts to assist clients differentiates us in the marketplace. We are investing in technology and talent to provide clients with advice and counsel in selecting a mortgage that meets their needs as well as a smooth and seamless mortgage experience – from application to servicing. We offer multiple channels to make it easier for our clients including SmartGuide, a digital platform that allows clients to complete their mortgage application entirely online. As Atlanta’s hometown bank for more than 100 years, we have a long history of serving the community and helping people achieve their dreams of owning a home. Where do you feel there are opportunities for the mortgage industry, and for your business, in particular, to improve? Moffitt: We tend to call ourselves a communication company that just happens to be really good at mortgages. We’re always trying to get better at that. We’re also addressing the cost of funds. We were recently acquired and our parent company has also since condensed the cost of funds and let us be really competitive because of it. I think you also have to focus on your execution all the way through the process. From a customer’s perspective, mortgages start to finish are 30-day windows. You have to either package the loan and sell it after closing, or you have to retain the servicing properly. There’s a lot more to it than just getting the loan to closing. With that said, I think if you ever lose sight of what you do every day in helping people buy homes and focus on too much of the other stuff, you’re not going to do too well. We always say we have to operate as if we’re at the closing table and see through that lens to make sure the customer’s experience is where it needs to be. Walther: This is a question that my team and I discuss daily. There is always room to grow and improve as the market changes daily and technology is always evolving. Our biggest opportunity is to build long lasting relationships while understanding the needs and wants of our clients. I have been in the mortgage business over 20 years and those demands have changed substantially. We must be flexible and open to growth and change. Shoemaker: As an industry and a company, we need to continually invest in people and technology to make it easier and more convenient for clients to achieve their dreams of homeownership while meeting their expectations to conduct business when, where and how they choose. Moffitt: I think the industry is experimenting a bit with AI and where that comes into play. Now, we can pull in a customer’s bank and income statements through API access and provide a smoother experience for the consumer. If a customer’s bank account is pulled into your operating system with a couple clicks rather than a PDF, it’s now machine-readable data. What rules can you write behind that data to make the customer’s experience better? What if, through some drop-down options, you could tell me about a large deposit in your account, and based on your answers, I could ask you for the documentation right then rather than a week or two into the process? This sounds wonderful in theory, but you have to be careful that you’re not just layering in technology when a customer may just want to talk to someone. You have to listen to the customer about what they like and don’t like. The industry is figuring that out. Walther: I believe technology to be both a blessing and a curse. While it provides the consumer access to information, it can also provide them the wrong information. Not all situations are the same. A mortgage is the biggest financial decision most will make in a lifetime. They need to ensure they are working with someone who understands this and is willing to take the time to understand their goals. In society, we are so programmed to focus on interest rate. While the rate is important, they need to consider so much more. Shoemaker: Technology is changing virtually all aspects of the mortgage business – making it easier for clients to apply for a loan when, where and how they choose, as well as creating a quicker and more seamless mortgage process. While technology, such as SmartGUIDE, is helping us enhance the client experience in many ways, we believe it needs to be coupled with delivering the advice and counsel to help clients select the mortgage that best fits their needs. The holistic approach of combining the right technology and the right expertise differentiates SunTrust in the marketplace.